When planning Thanksgiving, it is always difficult to figure out just how much to make of each item. With so many delicious side dishes stealing the show, how much of each is the right amount? We did a little research, and came up with the calculations, so you don’t have to. Hors d’oeuvres: I struggle with this every year, as I hate for people to fill up on appetizers when the real deal is coming right up. You do need something, so that people aren’t sitting around starving and worse yet, getting drunk before dinner. Consider 3-4 bites per person, or about 3 oz. each for a dip or spread. I often serve shrimp, and some kind of cheese straws or crackers and some spiced nuts to nibble on. I try to keep the preparation simple, since I am already spending two days in the kitchen getting the main meal ready, and don’t want to fuss with appetite spoilers. Soup: We love to start with a butternut squash or pumpkin soup. The rule of thumb is to make one 8 oz. cup per person, since there is a heavy meal to follow. We serve our soup course in delicate antique teacups and find that is just enough as a prerequisite to the big event. Turkey: Figure about 1 to 1 -1 /2 pounds per person. Since quite a bit of this is weight comes from bones, this amount should ensure that everyone is well fed and leave you with the requisite leftovers. If the breast meat is the most popular in your home, consider a smaller turkey, and an additional turkey breast to make up the difference. If you buy a boneless breast, consider 8 oz. per person the magic number. Gravy: Everyone we consulted cautioned against running out of gravy. The Food Network recommends 1/3 cup of gravy per person, and an extra cup for every six people. That means about three cups for every 6 guests. Potatoes: The quantities varied on this one, so err on the high side if you have potato lovers in the group. Suggestions ranged from 1/2 to 1/3 to even 3/4 pound of potatoes per person. It is probably best to just go with one potato per person regardless of weight. For those giant sweet potatoes and yams, figure 1/2 per person. If you are making both sweet and white potatoes, take that into consideration and err on the smaller amount, as people will likely take a bit of each. Cranberry Sauce: Our homemade cranberry apple compote, aka Cranberry Jones, is always a hit. Figure 1/3 to 1/2 cup of cranberry sauce per person. We can’t attest to how much of the jellied kind that comes out looking like a can might be consumed. Stuffing: Figure about 3/4 cups of stuffing for each person. We like to cook some inside the turkey and another batch cooked separately in the oven. People tend to for one or the other, as the consistency is different. The stuffing cooked in the bird is moist, and the other tends to be crisp. To each, his own! Rolls and biscuits: Go with about 1 1 /2 rolls per person, unless they are homemade, in which case I would consider 2 per person. I usually round it off, depending on the yield of the recipe. For 10 people, 18 rolls or biscuits should be fine. Salad and Vegetables: With everything else going on, this category seems to get left behind. I always make the mistake of dressing a large salad, only to toss it at the end of the evening. Where I would normally figure a large handful of greens per person, with a couple of extras for good luck, others recommend just one ounce of greens should do the trick. For other vegetables, the magic number seems to be about 4 oz. per person. That means a pound of green beans will feed about 4 guests. Pies and Cakes: While one pie yeilds about 8 slices, this is the time to aim high. My daughter always requests an extra pumpkin pie for the next day, when she and her grandfather eat it for breakfast. I usually offer a few desserts, but the pies seem to be the highlight on Thanksgiving. For 8-10 guests, make sure to have 2 pies. With all the dietary issues people have, take that into consideration when planning. 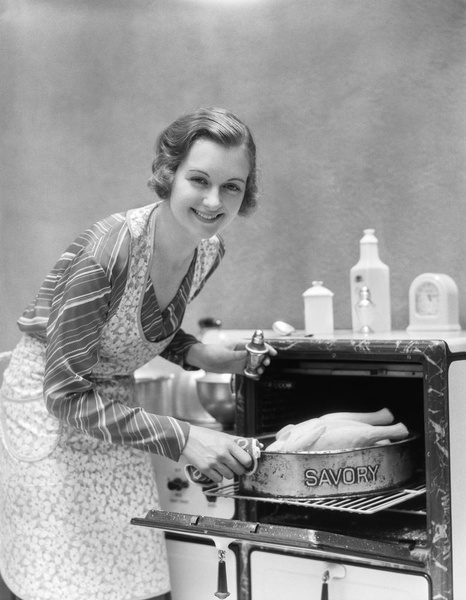 The vegetarians won’t touch the turkey, but they will likely consume more of the side dishes. Gluten free types won’t be indulging in rolls, pie or stuffing, but they may make up for it in by eating more of other foods. It is easy to be accommodating, if you plan ahead. While there is plenty to eat regardless of your diet, and I don’t think additional dishes are necessary, it is nice to use vegetable broth in the side dishes instead of chicken broth, if you are hosting vegetarians. One year, I took a scoop of every side dish as I was cooking and made that portion vegan. The guest was very grateful and able to enjoy the foods of the season and feel like they were part of the festivities. Nobody is expecting gluten free pies and breads, but the bulk of the side dishes should be edible for the gluten free crowd. Consider using corn starch instead of flour, or setting aside some gravy before it is thickened to accommodate their diet.